LBE-5AC-23 LiteBeam ac with InnerFeed Technology from Ubiquiti and take advantage of longer range, higher performance, and 3 axis adjustment flexibility. Operating on the license free 5 GHz frequency you can take advantage of data transfer rates of up to 100 Mbps at distances of up to 18 mi (30 km). 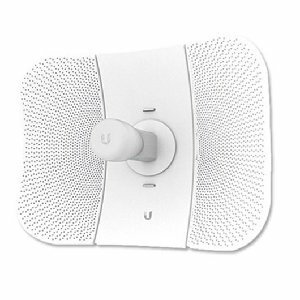 Additionally, this antenna features airMAX ac technology and 2x2 MIMO (multiple-input multiple-output) functionality supporting multiple data streams for faster more reliable connections. Combine the improved distance with Ubiquiti Networks own airMAX technology and you benefit from increased airtime efficiency through the use of Time Division Multiple Access or TDMA technology. Additionally, airMAX technology offers intelligent QoS and improved scalability. If you have any questions about this product by UBNT, contact us by completing and submitting the form below. If you are looking for a specif part number, please include it with your message.